Who doesn't want to live the good life? For millennia philosophers and theologians have debated what the the good life is. Is it more possessions? Is it more power? Is it more prestige? Is it more knowledge? Just what is it? The one thing the Greek philosophers all agreed on is, the good life springs from having meaning and purpose in your life. Jesus showed us what a life of meaning and purpose looks like. 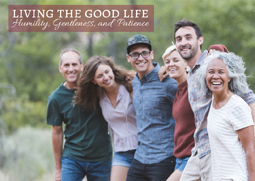 This week we begin a short but insightful series called, Living the Good Life. Let me just say the good life is more than you think and at the same time it much less than you think. With Jesus as our model we are going look at three innate qualities that we all have - humility, gentleness, and patience. You may read that and think, I am not always humble or gentle and I certainly run short on patience. Of course you do. So do I. The point is they are still innate qualities we all have and we are going see how they lead us to living the good life. A life that is full of meaning and purpose. We hope to see you this Sunday as we begin this enlightening, inspiring, and important new series. Invite someone to come and join the conversation.